* Wild yeast, ginger bug, reserved yeast from a former brew, or packaged. Place all plant material in water and bring to a boil. Simmer for 20 minutes, then turn off the heat. Stir in the sugar and raw cacao, then cover and allow to steep for 8 hours. Strain liquid into the fermenting vessel, stir in the yeast, and cover. Ready to bottle in 4 – 7 days. Prime each 750 ml bottle with ½ tsp of raw sugar, and ½ tsp of raw cacao. Liquorice and echinacea are synergistic herbs whenever they meet. The healing potential of echinacea in particular is greatly enhanced by the union. The addition of rosehip and aniseed myrtle in this brew adds to the immune boosting and antioxidant qualities. As with all medicinal herbs, we want to avoid leaving them too long on the heat. Once boiling point has been reached, a short, gentle simmer is best, followed by a period of steeping. This is a light coloured and very lively beer with a real taste of raw cacao. 750 ml bottles are generally primed with a teaspoon of sugar, but with this beer I have split the prime 50/50 between organic raw sugar and organic raw cacao. It forms quite the head, so ensure primary fermentation has ceased completely before bottling, otherwise undue pressure could build up. If fresh aniseed myrtle leaves are not available, substitute half the amount of dried leaf material, available from herb suppliers. The research on the properties of aniseed myrtle was conducted on dried material, so using this does not sacrifice the active components. Anetholea anisata (Vickery) Peter G.Wilson (synonyms: Backhousia anisata Vickery Syzygium anisatum (Vickery) Craven & Biffin), otherwise known as ringwood, aniseed tree, or aniseed myrtle, was utilised by both Indigenous peoples and early colonists. 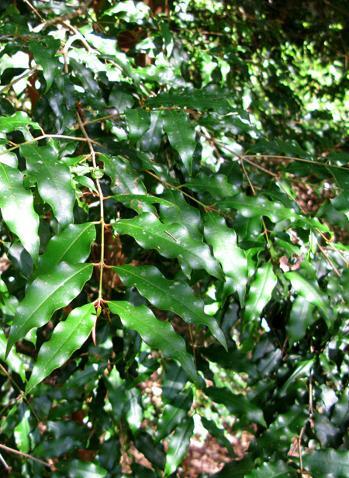 Aniseed myrtle has been assessed by RIRDC (Rural Industries Research and Development Corporation) and the results were published in 2007 and 2009. Aniseed myrtle was found to be high in Vit C, Vit E and folate, to have high levels of lutein, a useful compound for eye health, and also high levels of zinc, calcium and magnesium. The essential oils within aniseed myrtle have been shown to have strong activity against pathogens, including common food spoilage bacterium Bacillus subtilis, the cholera agent Vibrio cholerae, and Candida albicans. The oil is also rich in antioxidant compounds of both hydrophilic and lipophilic nature. If harvesting fresh aniseed myrtle leaves, please be mindful that this is a tree of limited distribution and numbers outside of plantations. Please harvest the material without compromising the viability of the plant. Thanks. Konczak, I., Zabaras, D., Dunstan, M., Aguas, P., Roulfe, R., Pavan, A. (2009) Health Benefits of Australian Native Foods, RIRDC Pub. No. 09/133. Zhao, J. and Agboola. S. (2007) Functional Properties of Australian Bushfoods, RIRDC Pub. No. 07/030.